The Purlovia (per-LOH-vee-uh) is one of the Creatures in ARK: Survival Evolved. Purlovia Maxima perfectly embodies the element of surprise. Though Nanictidopids such as Purlovia were once thought to be herbivores, I discovered that this creature is, in fact, a patient hunter of the most intelligent sort. After burrowing beneath the jungle floor, Purlovia enters a state of hibernation and can go extended periods without any food. When some unfortunate creature eventually wanders by, Purlovia bursts forth from the ground, tearing into its prey with its large canines before the victim can react! Though Purlovia is ill-suited to the life of a mount, its usefulness in staging an ambush or as a village guardian cannot be understated. With a tamed pack of Purlovia, one could assemble a literal organic minefield of deadly claws and teeth! Purlovia is a patient yet very aggressive carnivore which burrows beneath the ground, waiting for a wandering creature or passing player to ambush from beneath. While not exceptionally powerful, the cunning Purlovia leaps from its hiding place and stuns most creatures, preferring to attack and feast on its powerless prey. The Purlovia is capable of dismounting players from their tames. Resembling something akin to a giant weasel, Purlovia is actually a type of theriodont therapsid known as a Therocephalian. Although its fossil counterpart was herbivorous, the ARK's Purlovia is a vicious ambush carnivore. It has long front claws meant for digging out the burrows it uses to stage surprise attacks while its saber-like canines act as death dealers to its preferred prey - small to mid-sized ground herbivores like Dodo and Lystrosaurus, and passing survivors of the Ark. This section displays the Purlovia's natural colors and regions. For demonstration, the regions below are colored red over an albino Purlovia. The colored squares shown underneath each region's description are the colors that the Purlovia will randomly spawn with to provide an overall range of its natural color scheme. Hover your cursor over a color to display its name and ID. For example, "cheat SetTargetDinoColor 0 6" would color the Purlovia's "body" magenta. There is a polar variant that lives in the Snow Cave and the Ice Cave in Extinction and is identical to the normal variant except of its white color and it has a higher base health of 550. Also it can't be tamed. The Purlovia bites the target. When commanded, the Purlovia will burrow underground and wait for a target to come within a range before initiating a surprise attack. This section describes how to fight against the Purlovia. 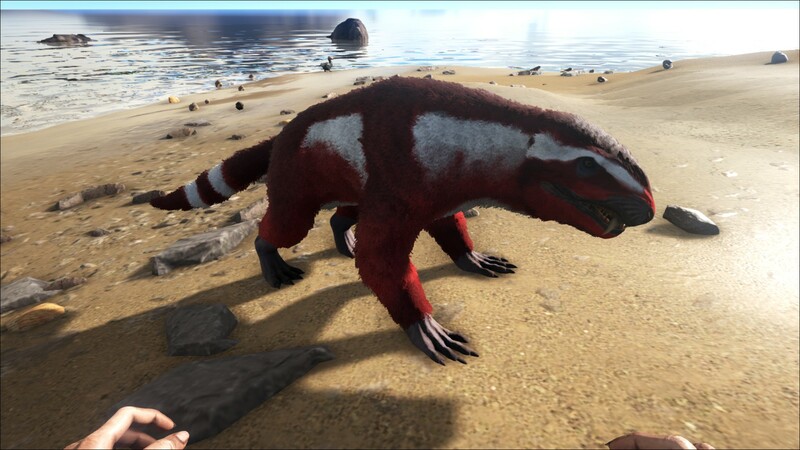 Purlovia themselves are not particularly powerful, being maybe a little more powerful than a lone Sabertooth. What makes them extremely dangerous is their single use surprise attack that stuns you for a quite long time. Best way to avoid them altogether is stay on medium to large carnivores, as they will not aggro at all and can quickly dispatch them if you do get attacked. If you do get attacked, pray that you will survive throughout the stun duration, and either retreat or fight back with recommended weaponry. Once you can fight back, Purlovia is not a tough enemy. Landing an arrow during their initial jump attack prevents stunning. As soon as you're stunned, spam 5 to 10 healing potions, and you'll survive. Tested with flak armor. Being very fast and its attacks having almost phenomenal knock back, it's good to bring powerful short-mid range weapons such as shotgun or weapon with quick reload or fire rate such as Assault Rifle. A shield is quite helpful if you can afford it, or a good land mount. The Purlovia is very fast, so even if it isn't hiding, it will be near you in no time and attacks rapidly. If you can imagine a furry wood chipper flying at your face, you understand the danger you are really in. Purlovia have relatively low torpor themselves, so knocking them out before moving in for the kill is a worthy strategy. Burrowed purlovia also leave a slight mound of dirt on the surface, so learn to spot these and the redwoods just became a little safer. Try running in zig-zag, as he is quite fast in attacking, then if timed right, he might miss you, possible to K.O if on higher grounds like rocks with ranged weapon. Land Mine: Due to its ability to burrow and surprise attack, it would be useful for defending your property. Non tribe members cannot see it when it's burrowed. Making it an effective ambush predator. Level up Health and Melee Damage. Hidden Vault: The Purlovia can't be seen by players that don't belong to the tribe it belongs to (allied tribes can't see it either), making it incredibly useful for hiding items. The only way to actually uncover and kill a hidden Purlovia is to explode the spot it's hiding in (such as firing a rocket launcher), making it a valuable dino for hiding large amounts of items if you pump enough weight into it. On PvP, it's recommended to set Purlovia on passive and burrow them away from any structures that may be blown up by raiders, seeing as the AoE damage of the explosives may uncover your Purlovia if it's in its radius. Also, do not forget to keep them fed if they are too far away from a feeding trough while hiding your items. Beware however of enemies riding Direwolves, as their keen noses can reveal where you've hidden your stash. Level up Food and Weight. Treasure Hunt: While not the most useful of roles, scattering Purlovia across the map, burying them with rewards, and providing clues on where to find them, can provide a fun pastime for you and your tribe. Hurting it with an explosion. Use the Troodon's Scout ability. Troodon's are rarely tamed due to their difficulty (having to sacrifice tames for affinity) and even more rarely brought on raids, though. Riding a Yutyrannus and using its intimidating roar will scare Purlovia even if it's hiding. Using a Direwolf's sniffing ability. Presence of a nearby burrowed Purlovia is/are marked with a blue mask icon. Using a Parasaur's scan ability. It will detect a Purlovia that has burrowed underground." Warning, The Purlovia can still dismount you from the Parasaur." Dino Dossier was revealed on May 10, 2016, on Steam. The real Purlovia was a type of herbivorous Therocephalian from Russia. This makes it the third creature to have a dietary change in the dossier, with the first being Arthropleura, and the second being Moschops. The skull that is seen in the dossier of Purlovia actually belongs to Bauria, which comes from a different family of therocephalians than Purlovia. Often referred to as "murder badger", "death mole" or more vulgar terms due to their lethality, behavior, and appearance. Yutyrannus is the only creature that can force Purlovia come out, it is also the only method to avoid its ambush aside explosive weaponry. Despite being large enough to ride, Purlovia is actually not rideable. In ARK: Mobile, the Purlovia can be conveniently unburrowed via a special whistle. The Purlovia was originally set to be released on ARK: Mobile in September 2018, however, the release had to be pushed back several weeks due to some bugs.